Lace legwarmers. So pretty and fun to make. Allison found this idea while on one of her design searches. She's a fan of pretty things and in dance class...perfect match. 1. 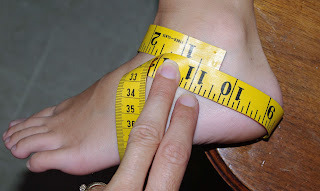 Measure the foot diagonally around the ankle. Don't have a foot, the circumference of a legwarmer will do, or the same place on a shoe. Measuring this part on a sock will give you a smaller measurement...socks stretch. Multiply the foot/shoe measurement by 1.5 to give fluff to the legwarmer. If you used a legwarmer as measurement...all done measuring. 2. 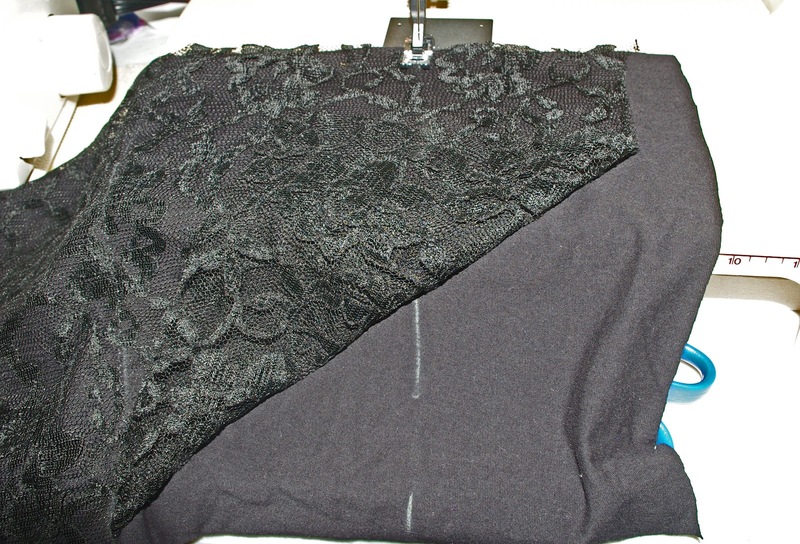 Cut lining and lace pieces. Cut 2 pieces of each. 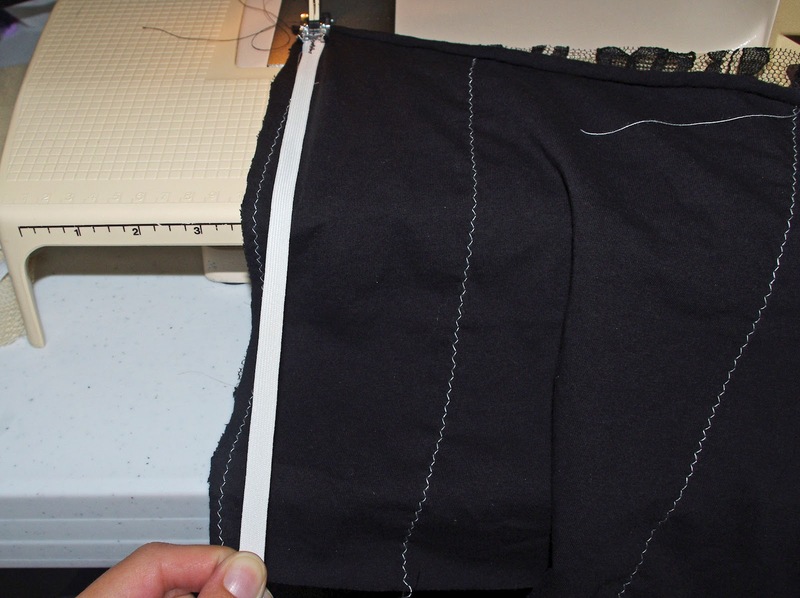 (Step #1 number by 1.5 times the length of the sock or leg) The longer/wider your pieces the more slouch you'll get. 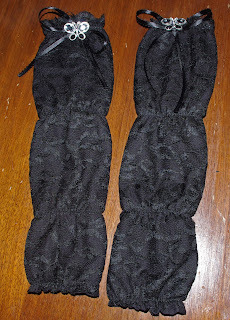 Our legwarmers could use more slouch...I didn't do 1.5 times on mine...was using a scrap of lace. I will make them larger next time. Too wide can be made smaller. Too narrow....out of luck. ***I used the scalloped edge on the lace as the top edge of the legwarmer. Cut 8 elastic strips the length of the foot measurement in Step #1. 3. With chalk mark the spacing. One strip at the top and bottom. Two others equally spaced in between. I eyeballed it. You can measure it out if you like. 5. Stitch on Elastics. 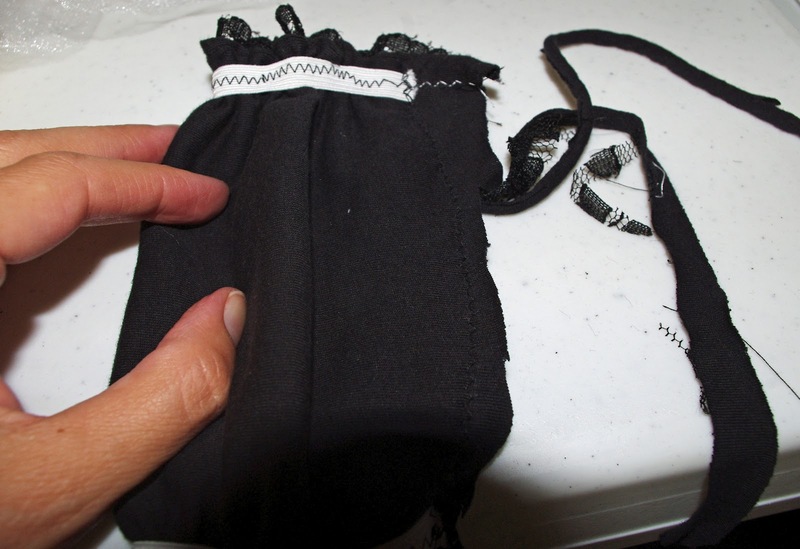 Place a strip on the lining side, on the stitch line. 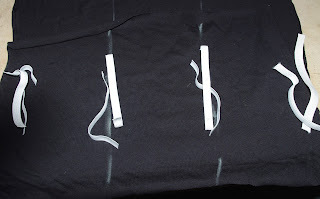 Sew a few zigzag stitches, back and forth to anchor your elastic. Pull the elastic to match the fabric. 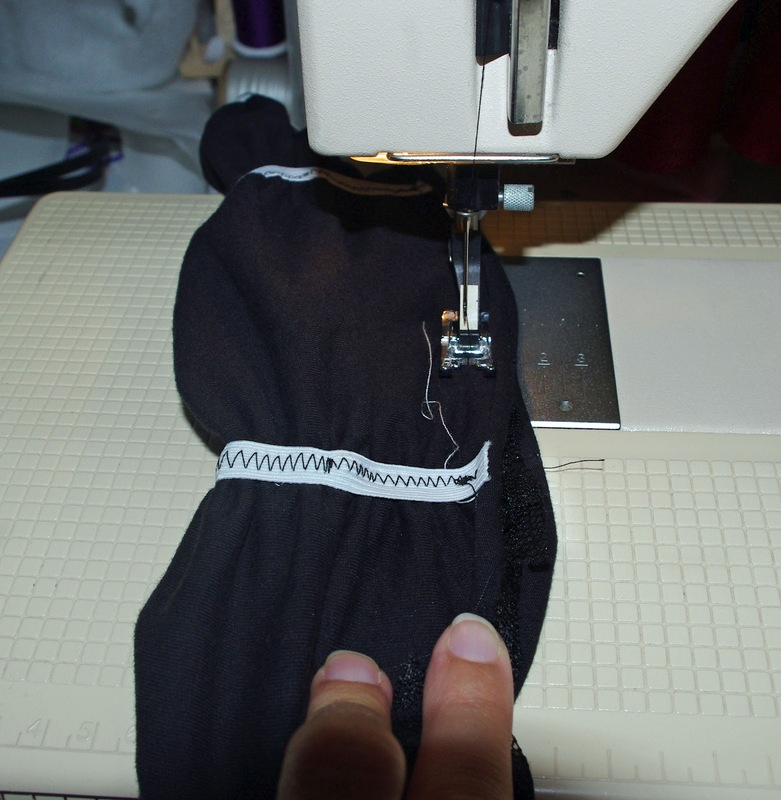 Stitch it down. I usually need to hold and guide/pull from the front and back of the machine for this to go smoothly. 6. Stitch the side seam with a zigzag. 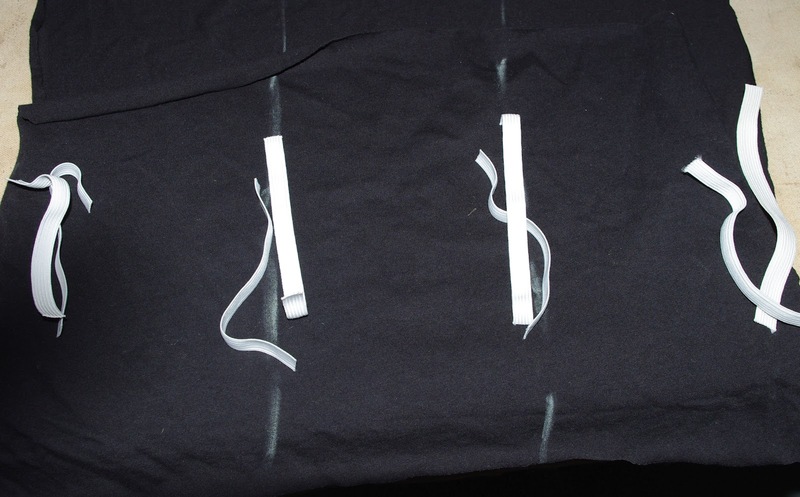 Line up elastics strips. 7. 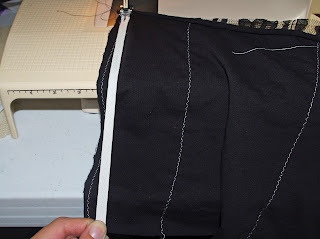 Trim off extra fabric. 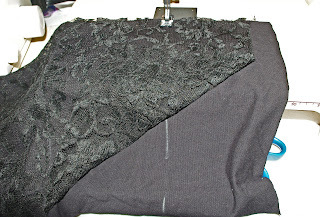 Knit and lace do not need any sort of seam edge finish. 8. Turn right side out. 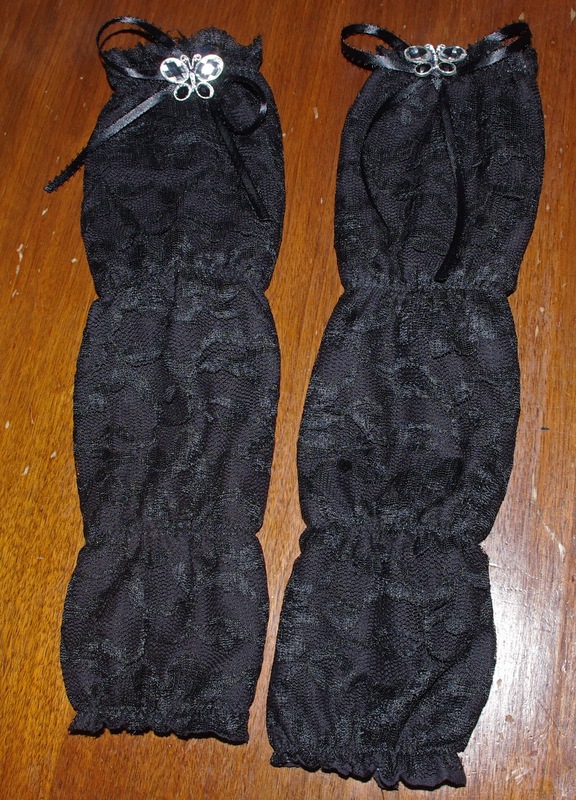 We wear legwarmers with the seam on the inside of the leg and usually put an embellishment on the outside of the leg. Our embellishments are a ribbon bow with butterfly center. The butterflies were taken from dangle earrings. I want to see pictures when you do.